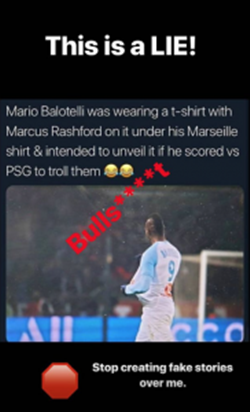 Mario Balotelli has refuted rumours that he planned to reveal a provocative t-shirt with an image of Marcus Rashford on it if he scored against PSG on Sunday evening. The Italian striker started as Marseille travelled to the Parc des Princes, but was subbed off on 65 minutes after failing to make any inroads. However, after the match, stories (which apparently originated somewhere on Canal+) circulated on social media that Balotelli was preparing to risk life and limb in Paris by revealing an image of the man who knocked PSG out of the Champions League in controversial VAR-assisted circumstances a fortnight ago. PSG ultimately had the last laugh by drubbing Marseille 3-1 to open the gap between the two sides in the league to a whopping 30 points, but that didn’t stop the mirth from spreading online.